Listing of property on different kind of classified and property management has become very common. Almost every seller who want to find buyers from internet uses these listing sites. But before listing the property on every one should notice about every site other wise it will be wastage of time and money. 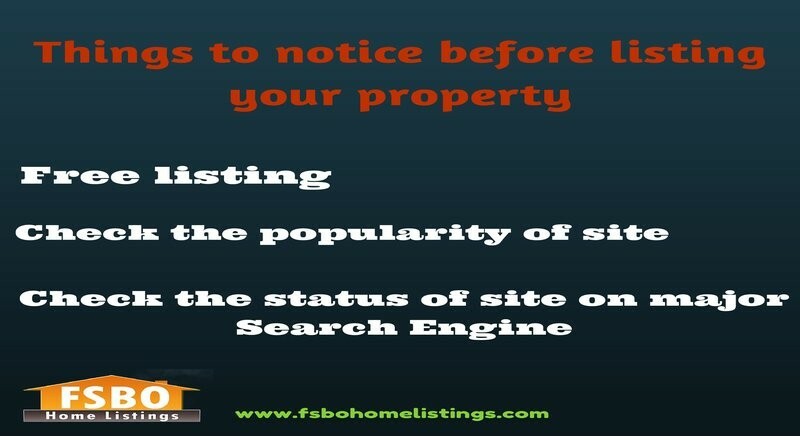 Here are some things which should be noticed before listing the property on such sites. Free listing: There are several free listing sites like FSBOHomeListing.com which are 100% free for seller to list their sites. It will be good to list the site on such sites. Check the popularity of site: If the site does not have enough popularity and visitors then it will be a wastage of time to use this as you will not get enough visitors on them. Check the status of site on major Search Engine: More than 90% of the persons take the help of search engine to visit the site. Check if the site is banned on major search engine like Google, Bing and Yahoo then surely it will not be able to fetch visitors and in the end our listing will go in vain. That’s why it is important to check the status of site before listing.